A public meeting becomes a battleground over plans to redevelop the once-proud Brooklyn Navy Yard. Local residents clamor for their own agenda in redeveloping 300 acres overlooking a sparkling downtown Manhattan, while business and real estate experts argue and city officials cower. 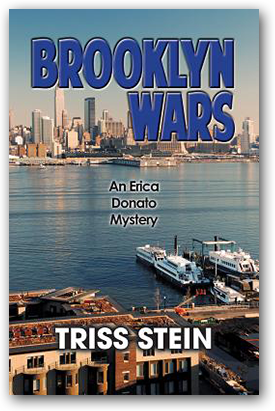 Erica Donato, still writing her PhD dissertation about changes in city neighborhoods, witnesses the shocking murder of a power-broker that night on the Yard's condemned Admirals' Row. Site design © & maintenance by xuni.com. All content © 2017-2019, Triss Stein.